“I’m afraid you’ve got a cataract in your left eye – right in the middle of the lens, which is why it’s bothering you. But it’s very treatable…”. My heart sank when the diagnosis was read out to me. The doctor was reassuring, but at this point, my mind was already wandering. I was upset and clearly distraught, but at the same time slightly relieved that it wasn’t something worse. And I’m only 29 this year – a bit too young to be getting cataracts, the doctor added. Thankfully, my right eye was perfectly fine. Earlier this year, I noticed my vision deteriorating in my left eye. It worsened dramatically around May and a quick visit to the Tan Tock Seng Hospital Eye Atrium cleared all doubt. So I’ve got a cataracts – now what? This is my story of the events that led to the day of the surgery, the decisions I made, and how I am coping post-surgery. A cataract is the clouding of the natural crystalline lens that you have in your eye. The result is cloudy and hazy vision. It normally develops in people over the age of 40 and is actually part of the aging process. Can it be prevented? Not really. What causes it? Exposure to UV light, use of steroid medication and injury to the eye, among others. In case, it was likely caused by years of topical steroid usage, to treat my eczema. The only way to treat a cataract is to replace the natural crystalline lens that we’re all born with, with a plastic lens implant. More on that later. I could decide not to ‘disturb’ the good eye and get a lens implant in my left eye that is slightly myopic (short-sighted). I’ll still need to wear glasses. I decided to take this route – and it involves implanting an artificial lens that has a diopter adjustment to correct my eyesight to perfect vision. To achieve balance in my other ‘good’ eye, I opted for LASIK. I had to have a barrage of tests done to my right eye to determine if I was a suitable candidate for LASIK. I was much relieved to know that I am a very good candidate. More about LASIK here. I reported to the day surgery center at Tan Tock Seng hospital and was accompanied by my cousin, who kindly took her day off to see me through the day and to accompany me home (it’s a hospital requirement) and for whom I’m grateful for the emotional support. Not before long, I was dressed in the surgical gown and wheeled into the theater, had a heart monitor stuck to my chest and a tube inserted up my left hand to deliver some kind of intravenous muscle relaxant, I think. “Nervous are we?”, smirked the anesthetist. “First surgery ever? Don’t worry, you’ll be fine!”. Good try doc – you really know how to calm my nerves. I was then wheeled into the operating theater, this cold sterile room with bright lights (Ouch! More bright orbs of light!) that is more reminiscent of a morgue. After transferring over to the operating bed, and getting a sheet draped over me with just a hole for the eye, alarm bells started sounding off in my head. Obviously, I was nervous, so the good doctor instructed the anesthetist to up the dosage a wee bit more, and soon I was feeling alright again. The sensation was that of having some sharp instrument poking into the side of eye, but I felt no pain, albeit very slight ‘prodding’ of something metallic into my eye and administering of additional drops of what I believe to be local anesthetics (they issued dilating drops much earlier – drops to dilate your pupils, hence making it easier for the surgeon to see into your eyeball). Not before long, the orbs of light were no more – in that they now appeared as random blobs of light with very little definition. I am guessing – and I may be wrong – that at this stage, the natural crystalline lens was either broken up via phacoemulsification (use of ultrasonic waves to break up the lens), or the lens was completely removed. A bit of prodding here, and a bit of prodding there, and at some point, the intra-ocular lens implant was inserted into my eye. Then the surgery was over. For me, the 10 to 15 minutes it all took seemed like forever. Recovery was fast – an hour after leaving the hospital, I could already see, albeit slightly our-of-focus. This is because my pupil was still dilated. I was given strict instructions – not to rub my eye, not to bend over (can’t have the lens implant sliding out of my eye, according to the nurse), and not to carry heavy objects. And of course, there was the usual medication, consisting of antibacterial and steroid drops, and an eye-shield to wear when I sleep (to prevent rubbing of eyes during sleep). Post cataracts surgery, I had my LASIK surgery done slightly over a week later. It was a great relief, because before undergoing LASIK, I had to rely on just my left eye to see, which in the interim was pretty challenging because of the visual imbalance between the two eyes. And to add on to an already burdensome situation, I was long-sighted in my left eye, and short-sighted in my right eye. In other words, I could only see something if it was either about three inches in front of me, or two meters away. I couldn’t see anything in between without the help of reading glasses. LASIK brought back my near vision, but that was effectively only through one eye – my right eye. 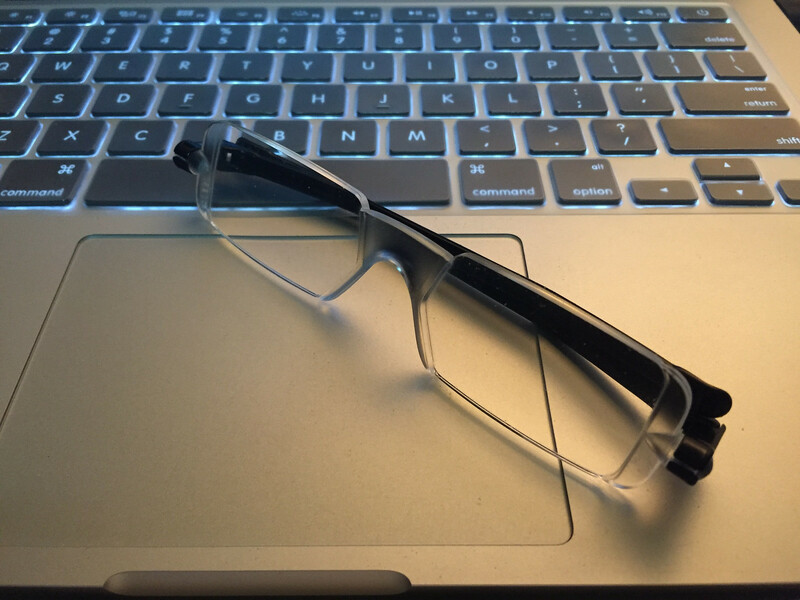 For reading and computer use, I am currently using a pair custom-made multifocals in place of my generic off-the-shelf uber ugly ‘old man glasses’. My left eye is ‘tuned’ permanently for distance vision – the lens implant is what some might call a ‘non-accommodating’ lens, because it doesn’t flex the same way our natural crystalline lens does when focusing. For everything else, I’m practically glasses-free. 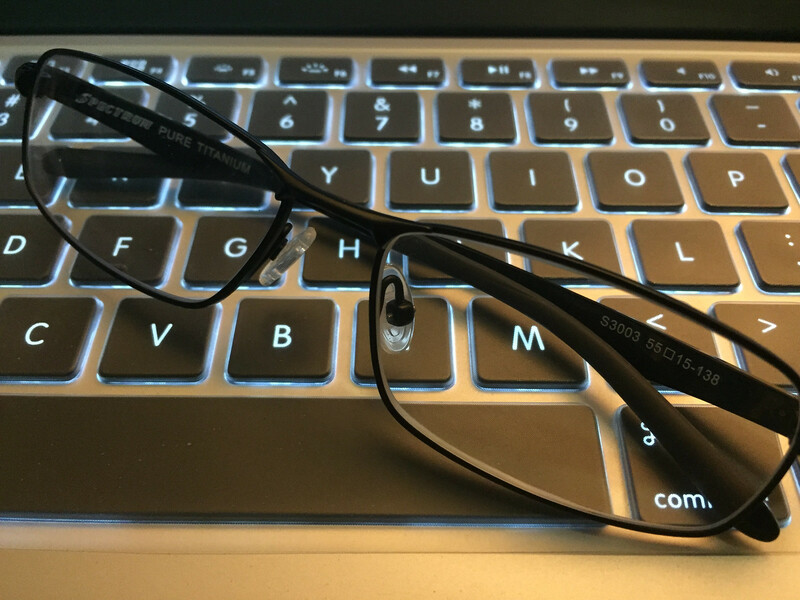 My ‘old man’ reading glasses.